For the last 20 years, the life of Edwin Pimentel (’93, Panama) has revolved around the production of ornamental plants. His work experience began in two companies in his home country, dedicated to the commercialization of flowers. After many years of experience as a worker, he decided to make the jump to business owner. With a lack of starter capital but an abundance of enthusiasm and an impressive collection of knowledge, Edwin ventured forth and created his own small business called Vivero Chiriqui, located in the tourist zone of the Volcan Province in Panama. The early years were the most challenging, as he recalls. From obtaining resources to finance the company, acquiring land, making the selection of plants to market, he fully dedicated himself to the production and management of his new life project. “The biggest challenge that I faced was learning how to be a good boss, leading a company requires alot of time. The planning is vital, and I had to create management tools to make decisions in the selection of qualified employees and the technical administrative control of the business. Above all, I learned how to delegate”, adds Edwin. Today, six years later, he sees the fruits of his labors and dreams of new expansion projects. Five permanent employees work in his company, with two additional employees reserved for seasons of high demand. His entrepreneurial eye enabled him to identify the local market niche, as in Panama, there are few who are dedicated to the production of ornamentals. 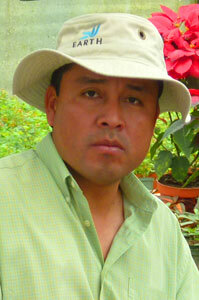 Currently, he sells more than 25 varieties of ornamental plants. “In town, we all know each other. People know that in our area there is a large nursery and although they are not our main target market, tourists always come to buy flowers and little plants in bulk,” says Edwin. As his company matured, so did his employees. They serve primarily as field workers and share a passion for the land. Edwin sees himself as a teacher who is challenged to teach every day, not only knowledge but also in ways to engage with customers and manage tasks. True to his socio-environmental training, Edwin has led projects in his community to implement proper waste management and raise awareness of the problem. He is currently working on a pilot project with several members of the community to produce seedlings for reforestation in various farms and watersheds in the Volcan area. Edwin Pimentel is one of the pioneer graduates of EARTH. He, along with 50 other young Central Americans, was chosen to start the first academic year of the University in 1990. Today, 20 years after he began his journey, he recalls the experience that would shape his worldview. ¨EARTH was the event that defined my future¨, said Edwin. The University opened its doors to take on life in a better way, and it has been instrumental in getting me to where he is now. He also recognizes that he was doubly privileged to have developed himself as a professional and also receive full financial support, without which he could never have studied at a university. “My experience at EARTH has made me feel like a different person as a professional and a father to my family. It has changed me into a completely different human being, it trained me to see different things in life”, concluded Edwin.